The O3b satellites launched atop an Arianespace Soyuz rocket. 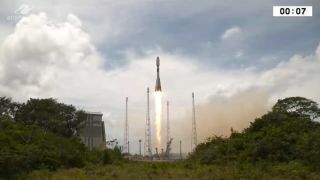 An Arianespace Soyuz rocket launches from French Guiana on April 4, 2019, carrying four communications satellites to orbit. An Arianespace Soyuz rocket delivered four communications satellites into space today (April 4). The rocket lifted off from French Guiana at 1:03 p.m. EDT (2:03 p.m. local time; 1703 GMT), kicking off a lengthy in-space cruise. By 2 hours and 22 minutes after liftoff, all four O3b satellites had deployed as planned, Arianespace representatives said. The spacecraft will be operated by SES, a company that performs secure satellite and ground communications solutions. The O3b craft will join a constellation that delivers connectivity equivalent to ultra-fast fiber speeds, Arianespace representatives said in a statement. The four new satellites, which operate in the Ka-band, will soon join the rest of the O3b constellation at an orbit of about 8,000 kilometers (nearly 5,000 miles) above Earth, or roughly 20 times the height of the orbit of the International Space Station. Arianespace said that these satellites will serve customers in almost 50 countries. Artist's illustration of O3b satellites in space. "They will improve connectivity capabilities, increase performance and serve to seamlessly scale the existing O3b constellation," Arianespace representatives said in a statement. "By increasing the size of the constellation from 16 to 20 satellites, SES Networks will offer enhanced coverage while providing greater service availability and reliability to cater for the increasing demand for bandwidth in government and in the telecommunication, cloud, maritime and energy markets." This constellation has been in commercial service since 2014, with satellites joining the swarm in groups of four after riding into space on board Arianespace Soyuz rockets. Arianespace also plans to send an SES geostationary satellite into orbit at an unspecified date, according to the statement. SES video customers access services through direct-to-home platforms and cable, terrestrial and IPTV networks. Customers use SES satellites for industries such as telecommunications, energy and aerospace. Editor's note: This story was updated at 3:35 p.m. EDT with news of the satellites' successful deployment.